Liberals are buying second-hand planes from Australia. 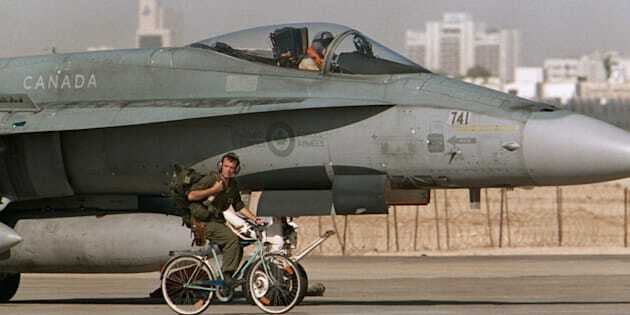 A Canadian CF-18 pilot prepares to take off, as a member of the ground crew pedals his bicycle past the jet in Qatar, on Jan. 20, 1991 during the Gulf War. OTTAWA — The Trudeau government is kicking off its latest bid to replace its aging fleet of fighter jets — and adding a new requirement to the procurement process by assessing a company's overall impact on the Canadian economy. The government is launching a full competition to replace Canada's aging CF-18s with 88 new fighters by as early as 2025, a move that comes in the midst of an ongoing trade dispute with U.S. aerospace giant Boeing. "Applications will be rigorously assessed on cost, technical requirements and economic benefit," Procurement Minister Carla Qualtrough told a news conference Tuesday. "Our government feels it is important to maximize economic impacts; as such, the evaluation of bids will also include an assessment of bidders on Canada's economic interests. This new assessment is an incentive for bidders to contribute positively to Canada's economy. "Bidders responsible for harming Canada's economic interests will be at a distinct disadvantage compared to bidders who aren't engaged in detrimental behaviour." Boeing has been eager to submit its Super Hornet to compete for the contract, which is valued at up to $19 billion and expected to start delivering jets in 2025. But the new stipulation could well have an impact on Boeing if its trade dispute with Canadian rival Bombardier is still alive and ends up being deemed harmful to Canada's economic interests. "After extensive consultations and careful analysis as part of the defence policy review, it was clear that a full fleet of 88 planes are required to fully meet our Norad and NATO obligations simultaneously," he said. "Our government will not risk-manage our national defence commitments." The Liberals are also officially abandoning a plan to buy 18 Super Hornets to temporarily boost Canada's CF-18 fleet, saying they plan instead to buy 18 second-hand fighter jets from Australia. "We have received an offer for sale of F-18 aircraft from the government of Australia, which we intend to pursue, and we have received an offer of Super Hornets from the U.S. government, which we intend to let expire," Qualtrough said. Since Canada already flies a version of the same fighter jet, "the supply chain and maintenance lines required to support these aircraft are already in place," Sajjan said.